Virginia Board of Physical Therapy 3.75 (Type 1)–Please check with your state board for approval as most physical therapy boards will reciprocate approval for continuing education. The American Academy of Health and Fitness (BOC AP#: P3645) is approved by the Board of Certification, Inc. to provide continuing education to Certified Athletic Trainers. This program is eligible for a maximum of 3.75 Category A hours/CEUs. Developing Agility and Quickness for Sport Performance™ continuing education home study course addresses the physical and cognitive components of agility and quickness. Applicable to most all sports, this course focuses on improving quickness of foot and change of direction speed, along with perceptual and decision making factors. It covers the essential components of developing rapid force high power output and explosive movement that allow athletes to achieve high-level performance. It includes more than 100 drills to help in the development of safe, effective and comprehensive training programs. This home study course is offered to you in a distance-learning format providing continuing education for health and fitness professionals who wish to help athletes take their performance to the next level. The best training advice, drills, and programs for optimizing athletes’ linear and lateral movements are presented. This is a must have resource for developing successful athlete specific and sport-specific training programs. 1. Discuss how agility and quickness impacts sport performance. 2. Identify and discuss the factors that influence agility and how to develop these attributes. 3. Explain how perceptual and decision-making skills impacts agility performance. 4. 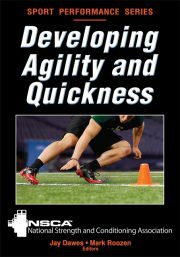 Describe methods for evaluating, assessing, and monitoring agility and quickness. 5. Identify and explain at least 5 drills for developing agility. 6. Identify and explain at least 5 drills for developing quickness. 7. Discuss the basic foundations of designing agility and quickness programs. 8. Apply the basic foundations of agility and quickness program to sport-specific training. Electronic format — The Developing Agility and Quickness for Sport Performance™ certificate package with online test includes the eBook version of the 200-page Developing Agility and Quickness by Jay Dawes and Mark Roozen, Editors (accessed through Adobe Air with instructions for downloading Adobe Air*) and a 55-page workbook provided in PDF format. Instructions for completing the multiple-choice online test and obtaining CECs are also included in PDF format. Note: This course package is made available for immediate access and download after purchase. All materials for this electronic format course are available electronically. Nothing is mailed. The workbook and examples of drills in the text book. EXCELLENT program, I feel more knowledgeable today and confident moving forward with my clients and players. Evaluations prior to new system. 2015-06-25 17:57:37 WITS Agree Disagree Agree Be a great trainer and incorporate the drills I learned from this course.